Are you a WordPress developer or a Web Designer who uses WordPress to develop websites for your clients? Or are you a novice WordPress user? Have you ever wanted not to show Pages, Posts or Categories in the menu? Or wanted to restrict access to certain content on your website? With Pages by User Role, you can add Access Control to the following things in WordPress based on which Role the user has. The plugin also removes the Page, Post, Custom Post Type, Categories or Custom Taxonomies from search results and blog roll. You can hide Page and Categories from the menu when users are not logged in. You can also set a specific redirect URL for users that don’t have the required User Role. It also works if you are using the custom menu feature built into WordPress. It will hide the menu items that has assigned a user Role when the user is not logged in. Set default redirect URL for users that does not have access to a Page, Post or Custom Post Type. Restrict access to Access Control Metabox by User Role on Pages, Posts and Custom Post Types. Revert the Pages by User Role behavior to the backend instead of the original frontend. 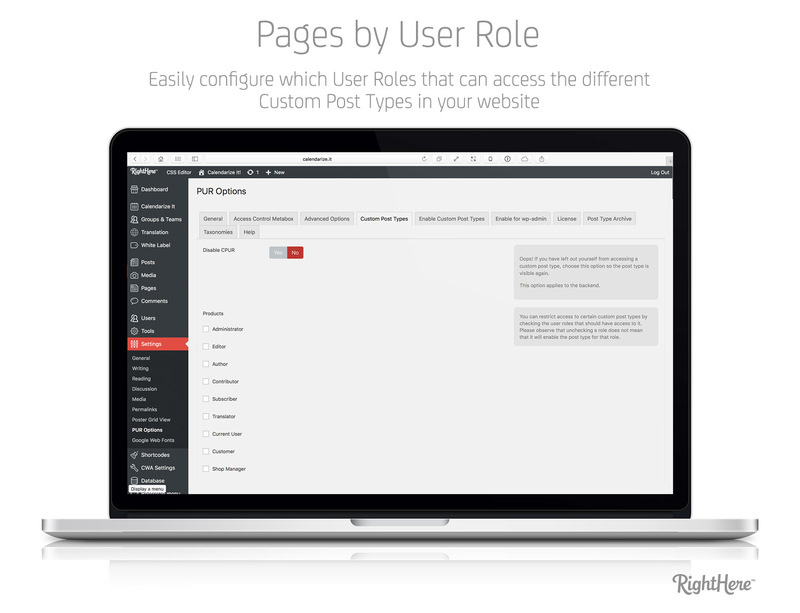 Set individual redirect URL for each Pages, Posts and Custom Post types when a User Role doesn’t have access. 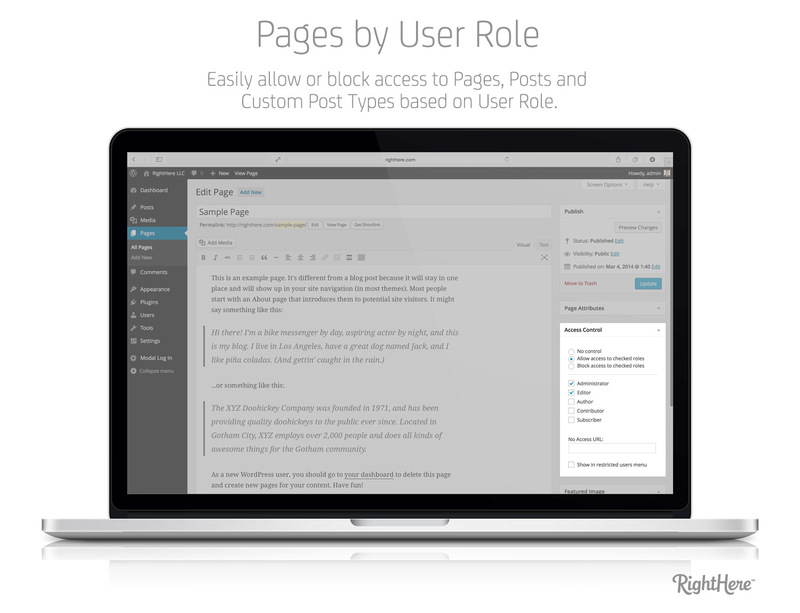 Compatibility Fix: Pages by User Role caused the content of blog posts on some websites to be hidden when using WordPress Notification plugin and Pages by User Role. 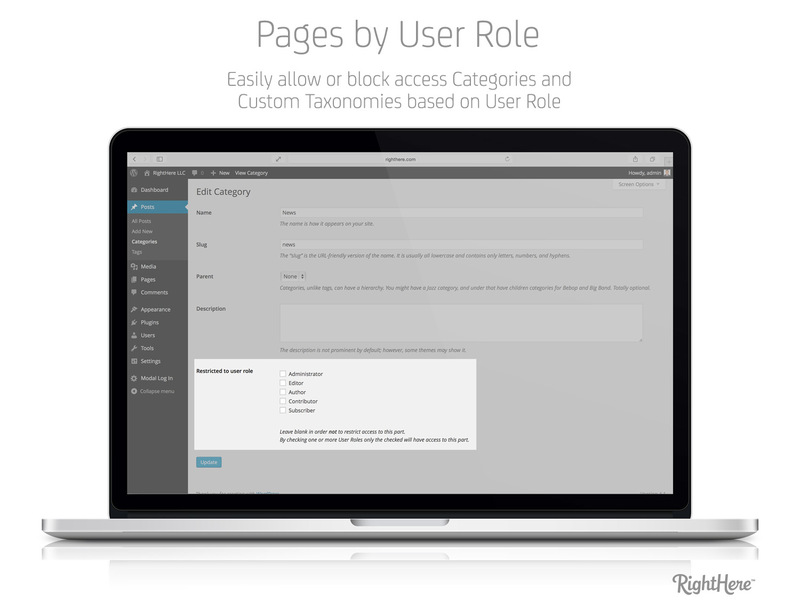 Bug Fixed: When blocking access to a Page for one specific User Role and allowing users that are not logged in to access the page, the remaining user roles were blocked. This was related to the new feature we just introduced. Compatibility Fix: Added check for WooCommerce Shop, Cart, My Account and Checkout) to avoid PHP warning. Compatibility Fix: Change classes where the constructor has the same name as the class to __construct (PHP 7 compatibility). Bug Fixed: When blocked post id?s make the query result empty, the blocked posts are not blocked at all. Bug Fixed: When using inverted PUR the edit post link in the toolbar was still visible, and the user can actually bypass the restriction and edit the post. Bug Fixed: Handle a situation where under some buggy conditions, output have been already sent by the site, before it should, and thus breaking redirection. New Feature: Added a setting to restrict what user roles will be able to view the ?Access Control? Metabox. to visitors NOT logged in. New Feature: Show Allow as Green and Deny as Red. New Feature: pur_restricted Shortcode now allow alternative text with HTML. page should redirect to login or to redirect URL. redirect to login or to redirect URL. restricting admin access to that post type only to the checked user role. VERY IMPORTANT: Always check the Administrator. Note we do not do it by default, thus maybe the Administrator changed the administrator user role, so we don’t really know what the administrator role is. In the case of incorrectly setting the administrator user role, there is an option on the same tab to disable this feature and recover access to the custom post types. Bug Fixed: After setting user roles in Category and removing all, all roles where denied access afterwards. Update: Changed the procedure for redirect; 1) the custom url 2) the default url 3) the login page 4) if you are logged in and do not have access, an error message is shown. New Feature: Restrict access to Post by using the Posts ID.